– Dr Sun Yat-sen’s speech at The University of Hong Kong in 1923. Founded in 1911, The University of Hong Kong (HKU) is the territory’s oldest institute of higher learning. Dr Sun Yat-sen studied from 1887 to 1892 at the College of Medicine for Chinese, Hongkong, which was incorporated into the HKU in 1912 as the Faculty of Medicine. Dr Sun visited the HKU on 20 February 1923 and gave a public speech in the Great Hall (now Loke Yew Hall), in which he declared that “Hong Kong and The University of Hong Kong are my intellectual birthplace”. Hong Kong had been regarded as the cradle of Dr Sun Yat-sen’s revolution. 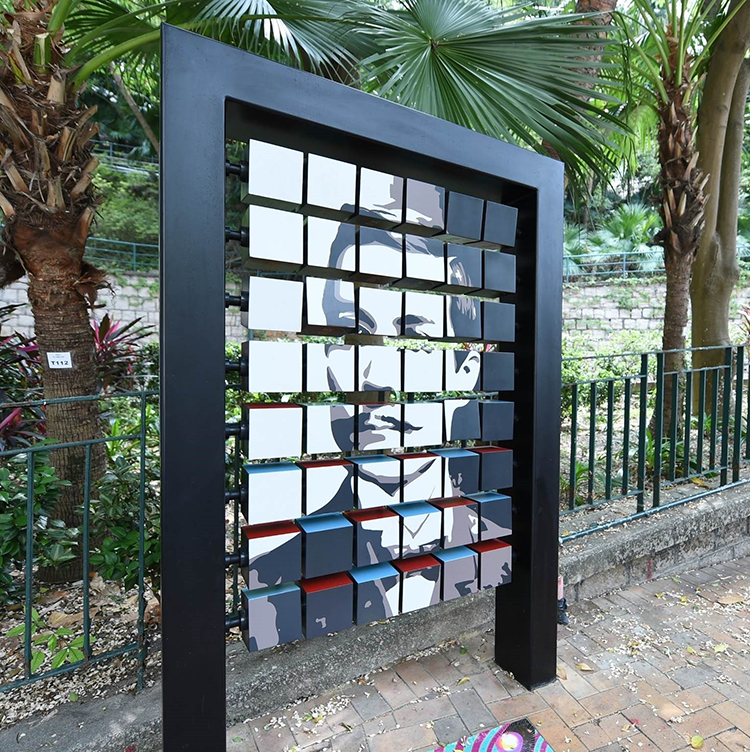 The artwork is based on his speech delivered in The University of Hong Kong in 1923, extracting the concept from his speech and creating an interactive installation with texts and images to arouse the public reflection on Dr Sun’s vision of society, revolution and future. Justin Wong, comic writer and media artist, received his BA (Fine Arts) in Chinese University of Hong Kong in 1996 and his MA (Interactive Digital Media) in London. Upon his return to Hong Kong in 2004, he taught in the School of Creative Media in City University of Hong Kong and worked as Art Director in an interactive media company. At the same time, he began to work for local newspaper as comic writer and illustrator. In 2007, he started his political comic column Gei Gei Gaak Gaak in Ming Pao Daily. He is now an Assistant Professor in the Academy of Visual Arts in Hong Kong Baptist University.